This lecture will describe the use of autologous onlay block bone grafting for reconstruction of moderate to severe atrophic maxillary alveolar ridge. This will include a discussion of the various options to this form of grafting, such as short implants, maxillary sinus augmentation, sub-nasal elevation procedure, connective tissue grafting and soft tissue manipulation, Le-Fort I down fracture/osteotomy and the use of progenitor cells: bone marrow aspirating concentrated. The Mutli-Tier onlay Bone Graft Technique will be highlighted in this presentation. 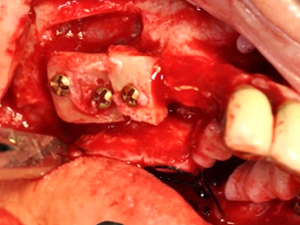 Additionally, a review of a recently submitted research paper of long term follow up of implants placed into autologous bone blocks harvested from the mandibular ramus, immediate loading by pre-computer-aided/pre-prepared temporary bridge areas will be discussed. A description of surgical donor harvest sites in the mandible will also be performed as well as post-op healing of these sites. Additional time will be spent reviewing causes of failure with bone blocks and implants placed into these sites. This lecture will describe the use of autologous onlay block bone grafting for reconstruction of moderate to severe atrophic maxillary alveolar ridge. This will include a discussion of the various options to this form of grafting, such as short implants, maxillary sinus augmentation, sub-nasal elevation procedure, connective tissue grafting and soft tissue manipulation, Le-Fort I down fracture/osteotomy and the use of progenitor cells: bone marrow aspirating concentrated.